Delta Sagittarii (δ Sagittarii, abbreviated Delta Sgr, δ Sgr), also named Kaus Media, is a double star in the southern zodiac constellation of Sagittarius. The apparent visual magnitude of this star is +2.70, making it easily visible to the naked eye. Parallax measurements place the distance at roughly 348 light-years (107 parsecs) from the Sun. Eggleton and Tokovinin (2008) list Delta Sagittarii as a binary star system consisting of an evolved K-type giant star with a stellar classification of K3 III, and a white dwarf companion. The giant is a weak barium star, most likely having had its surface abundance of s-process elements enhanced through mass transfer from its orbiting companion. It has an estimated 3.21 times the mass of the Sun and is about 260 million years old. δ Sagittarii (Latinised to Delta Sagittarii) is the star's Bayer designation. It bore the traditional names Kaus Media, Kaus Meridionalis, and Media, which derive from the Arabic قوس (qaws, meaning "bow") and Latin media (meaning "middle"). In 2016, the International Astronomical Union organized a Working Group on Star Names (WGSN) to catalog and standardize proper names for stars. The WGSN's first bulletin of July 2016 included a table of the first two batches of names approved by the WGSN; which included Kaus Media for this star. In the catalogue of stars in the Calendarium of Al Achsasi al Mouakket, this star was designated Thani al Waridah, meaning 'second of Warida'. 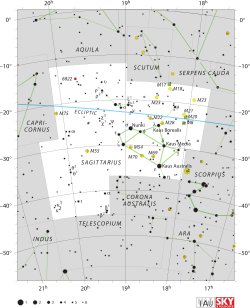 This star, together with Gamma Sagittarii, Epsilon Sagittarii, Zeta Sagittarii, Lambda Sagittarii, Sigma Sagittarii, Tau Sagittarii and Phi Sagittarii, comprise the asterism 'Teapot'. In the Hindu system of astrology, this star is also called Purvashada Nakshatra. ^ a b Luck, R. Earle; Challener, Sharon L. (December 1995), "Chemical Abundances for Very Strong-Lined Giants", Astronomical Journal, 110: 2968, Bibcode:1995AJ....110.2968L, doi:10.1086/117741. This page was last edited on 7 April 2019, at 05:24 (UTC).